India – In conjunction with the design week in Paris and London, Raffles Interior Designers and Creative Practitioners from Raffles Delhi visited Europe for an enriching learning experience in September 2014. They gained a better understanding of the rich cultural heritage in both world class cities, and became more enthusiastic in their coursework. Their first stop was at the Belleville District in Paris, a lively area with a vibrant mix of youth and a rich history, and also visited the Notre-Dame de la Croix Church. The next day, they visited one of the world’s largest museums and a historic monument, the Louvre Museum, followed by the legendary Champs Elysees, the Petit Palais art museum, the awe-inspiring Eiffel Tower and Hector Guimard’s Castel Beranger, a private apartment building or the first example of Art Nouveau in Paris. On the third day, they visited Pompidou Centre, one of the world’s greatest examples of structural and mechanical systems and its exposition in an architectural context. The building also showcases a strong collection of modern classics, representing both art and design. On day fourth, they went to Louis XIV’s Versailles Palace, one of the most notable example of architectural and design genre. 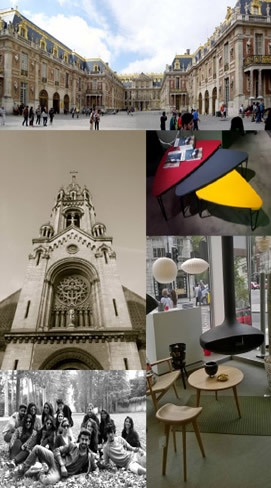 The subsequent visits were to the vast historical collections of the Victoria and Albert museum, and also Interior Design showrooms at the London Design Week to understand about the various styles and product lines.